Is Christ divided? There are more than 250 major denominations in America alone — and other hundreds of little groups and sects. WHY? When did this confusion originate? How much do you really know about the TRUE CHURCH? Where has it been? Have you supposed it was re-established at the Protestant Reformation? IT WAS NOT! You will be ASTONISHED to see the true history of GOD'S Church. This true history, authentically documented, is breathtaking. IT IS HARD to believe, but it is TRUE! The actual FACTS of history — both Biblical and secular — are astonishing! Every thinking person — every denomination — realizes that, at some time in history, THERE HAS BEEN A GREAT APOSTASY OR FALLING AWAY from original TRUTH. Protestants and Catholics may dispute the TIME of its occurrence, but they know that it happened! Jesus Christ did not found MANY DENOMINATIONS! Christ said, "I will build my Church." HE DID BUILD IT! ONE Church, commissioned to preach and to publish His Gospel — the very Message He brought from God — to all the world! But what do we find today? Hundreds of different and disagreeing SECTS, all founded by MEN, each PROFESSING to teach the truth, yet contradicting and disagreeing with all the others — a modern religious Babylon! But what is a "sect"? According to Webster, it is "a group that has BROKEN AWAY FROM the established Church." Who established the Church? — Christ! Today's host of sects or denominations have BROKEN AWAY from that established parent Church — they teach different doctrines and observe different practices! The religious sects of Jesus' day were the Pharisees, the Sadducees, the Essenes, the Samaritans. They had BROKEN AWAY from the true parent Old Testament Church established by God through Moses. Jesus joined none of them. On the contrary, He called His disciples OUT OF THEM! The Greek word "ecclesia," translated "Church" in English, has the meaning of "called-out ones." Christ's instruction to His Church, through the New Testament, was NOT to participate in this world's politics and affairs in an effort to make THIS WORLD a better world. Instead, His command to His Church is, "COME OUT FROM AMONG THEM, AND BE YE SEPARATE" (II Corinthians 6:17). In His final prayer for His ONE Church, Jesus prayed: "I pray for THEM: I pray NOT for the world ... Holy Father, keep THROUGH THINE OWN NAME those whom thou hast given me, THAT THEY MAY BE ONE, as we are. I have given them thy word, and THE WORLD HATETH THEM, because THEY ARE NOT OF THE WORLD, even as I am not OF the world. I pray not that thou shouldest take them out of the world, but that thou shouldest keep them from the evil. THEY ARE NOT OF THE WORLD. even as I am not OF the world" (John 17:9-16). Jesus did command His BODY — the collective Body through which the Spirit of God does the WORK of God — to go INTO all the world and preach and publish His Gospel. But those of His Church are described as being strangers and foreigners in this world — as AMBASSADORS for Christ — representing HIS Kingdom which is FOREIGN to the world — yet never being OF the world! Now let's notice what was prophesied to happen to the Church. This true Church of God was to be PERSECUTED — -SCATTERED! If they have persecuted me, they will also persecute you," said Jesus to His disciples (John 15:20). "ALL that will live godly in Christ Jesus SHALL SUFFER PERSECUTION" (II Tim. 3:12). On the night Jesus was seized to be crucified, He said: "It is written, 'I will smite the shepherd, and the sheep shall be scattered'" (Mark 14:27). After HE, the Shepherd, was crucified, the "sheep" — HIS CHURCH — were to become SCATTERED! Previously, that same evening, Jesus had said to His disciples: "Ye shall be SCATTERED" (John 16:32). This persecution and scattering began early. Notice Acts 8:1: "And at that time there was a GREAT PERSECUTION AGAINST THE CHURCH which was at Jerusalem; and THEY WERE ALL SCATTERED ABROAD throughout the regions of Judaea and Samaria, except the apostles." Read what Daniel says about the true Church: "And they that understand among the people shall instruct many: YET THEY SHALL FALL BY THE SWORD, and by flame, by CAPTIVITY, AND BY SPOIL, MANY DAYS. Now when they shall fall, they shall be holpen with a little help: BUT MANY SHALL CLEAVE TO THEM WITH FLATTERIES. And some of them of understanding shall fall, to try them, and to purge them, and to make them white, even to the time of the end" (Dan. 11:33-35). The prophet Ezekiel foretold this scattering — chapter 34. Daniel again foretold it: "When he shall have accomplished to SCATTER the power of the HOLY PEOPLE (Church), all these things shall be finished." That is the end of the age (Dan. 12:7). Nowhere is there any prophecy that the one true Church should become great and powerful, exerting influence in this world. Rather, Jesus called it the "Little Flock" (Luke 12:'32), despised, persecuted, scattered BY the world — separate FROM the world! Scattered, but NEVER DIVIDED! Always ONE Church, speaking the SAME thing — NEVER many differing sects! You have not read much of the history of THAT Church! Even the historians never knew where to look for the TRUE Church — for they did not even know WHAT the true Church IS! On the other hand, all the prophecies foretold that in the WORLD apostasy, deception, counterfeit "Christianity," and division would occur. Jesus foretold the very FIRST event to come on the world — GREAT DECEPTION — climaxing, in OUR day now just ahead, in GREAT TRIBULATION! "Take heed," He said, "that no man deceive you. For MANY shall come IN MY NAME, SAYING I am Christ, and shall DECEIVE MANY! (Mat. 24:4,5). Yes, the MANY would come IN JESUS' NAME, proclaiming that Jesus is the Christ — yes, preaching CHRIST to the world — and yet DECEIVING the world. Jesus had pictured this same condition, when He said: "Wide is the gate, and broad is the way, that leadeth to destruction, and MANY there be which go in thereat: because strait is the gate, and narrow is the way, which leadeth unto LIFE, and FEW there be that find it" (Mat. 7:13-14). And no wonder! For Satan himself is pictured in the Bible as the "god of this world" (II Corinthians 4:4). He appears, NOT as a devil, but as a GOD — as an angel of LIGHT. And in Rev. 12:9, you read of "Satan, which DECEIVETH the WHOLE WORLD. ASTOUNDING? Of course it is! Hard to believe? Yes, but it's TRUE! How have the MANY been deceived? Simply by a preaching about the PERSON of Christ — extolling His virtues, worshipping Him, yet denying His MESSAGE — His GOSPEL — by substituting pagan beliefs while preaching ABOUT Christ! What a clever counterfeit! And many — perhaps most — of those so preaching in Christ's name are sincere — THEMSELVES deceived! It is SATAN who has deceived even THEM! It is SATAN who has made himself the GOD OF THIS WORLD — and thus is worshipped AS God. This world DOESN'T KNOW the true God, strange as that may seem! This world believes that if one "accepts Christ" — "makes his decision for Christ" — "WORSHIPS Christ" — he is saved! Listen! "In VAIN do they worship Me," said Christ, "teaching for doctrines the commandments of men ... making the word of God of none effect through your tradition" (Mark 7:7,13). That is difficult to believe, isn't it? You have been so drugged, so poisoned, so deceived by this world's deceptions- -Satan's COUNTERFEITS — that even the words of Jesus are difficult to believe! May GOD HELP YOU TO BELIEVE CHRIST! It is one thing to believe ON Christ — that is, in His Person — and something altogether different to BELIEVE CHRIST — to believe what He SAYS. Shocking though it is, the overwhelming majority HAVE BEEN DECEIVED by ministers who come in the name of Jesus Christ, proclaiming that Jesus is the Christ, but who teach a different Gospel and a different faith! They are those who, themselves being deceived from childhood, brought up in these deceptive beliefs, enter the ministry to earn a living, who choose it as their vocation or job, who decide to appoint THEMSELVES as Christ's representatives, yet who were NOT called by Christ to be His ministers! They have hired themselves out to the people, and therefore must preach what the PEOPLE want to hear! They do NOT correct or reprove their congregations for rejecting the doctrines JESUS taught and for transgressing God's law, which the BIBLE defines as SIN! Very few really know what the true Church is. The true Church is the collective body of individuals, called out from the ways of this present world, who have TOTALLY surrendered themselves to the rule of God, and who, through the Holy Spirit, become the begotten sons of God (Rom. 8:9). Jesus has purchased THIS CHURCH by shedding His own blood for it (Acts 20:28). The true Church is not some POLITICALLY ORGANIZED DENOMINATION which one joins or becomes a member of in order to be "saved." Jesus did not die for some one religious ORGANIZATION called a church. Joining a local church congregation does NOT put you into God's Church. You can't JOIN the true Church; ONLY GOD CAN PUT YOU INTO IT BY HIS SPIRIT. "For by one Spirit are we all baptized into (put into) one Body" (I Cor. 12:13). GOD makes you a member of His Church — if you surrender your life to Him — even if you have NO LOCAL church with which to fellowship. When God's Church first began on the day of Pentecost, Peter gave the answer to this question. REPENT and HE BAPTIZED every one of you in the name of Jesus Christ for the remission of sins, and ye shall receive the gift of the Holy Spirit" (Acts 2:38). We have to realize our OWN WAYS are wrong, that they have brought on ALL the suffering about us. We must be willing to REPENT and completely turn from our former ways and let God rule our lives. Then we should be BAPTIZED. Paul explains it in Romans 6:1-6 as the outward sign of our willingness to completely BURY our old self in a watery grave and come up to walk in newness of life — following Jesus' example. Then we are promised the "gift" of the Holy Spirit to guide us in obeying and following Christ — our REAL Lord and Master. This gift puts us into the Church, as we read in I Cor. 12:13. Before He ascended to the Father, Jesus prayed that His Church would be kept ONE in the Father's name. "Holy Father, KEEP THROUGH THINE OWN NAME those whom thou hast given me, that they may be ONE, as we are (John 17:11). The true Church — the "Church of God" (I Cor. 1:2) — is not many divided, quarreling denominations, but ONE Church, composed of many scattered members, ONE Church united in Spirit, mind, attitude and heart because its members have totally surrendered their wills to God and have yielded to correction and reproof from the Word of God — the Bible. How many denominations have been willing to admit where they have been wrong, how many allowed the Holy Spirit to guide them into truth? The Church which Jesus is building is the collective body of those SCATTERED individuals who have God's Holy Spirit, who admit it when they are wrong, as the apostle Peter did when he made a serious mistake (Gal. 2:11), and who accept the truth. Now notice Jesus' promise in John 16:13. He would send the Spirit of truth who will GUIDE YOU INTO all truth. Here is the KEY that proves which individuals are in God's Church. It is composed ONLY of those who are GROWING INTO TRUTH as God reveals it. The moment anyone ceases to GROW, but wants to retain only what he had five or ten years ago, FROM THAT MOMENT ON THE HOLY SPIRIT CEASES TO LIVE IN HIM. It is the FEW — not the many — who understand the truth in this age. "For ye see your calling, brethren, how that NOT many wise men after the flesh, NOT many mighty, NOT many noble, are called"(I Cor. 1:26). The world CANNOT receive the truth (John 1:5). Jesus explained why, by saying: "Men love darkness rather than light, BECAUSE THEIR DEEDS ARE EVIL (John 3:19). But the world does not believe that its deeds are evil! And no wonder — for the whole WORLD has been deceived — AND IT DOES NOT KNOW IT! People do not recognize truth when they hear it. They have been deceived without realizing it! They want to be lulled to sleep by false ministers who preach what the people want to hear. It was the same in apostolic days. Scarcely twenty years after the crucifixion of Jesus, the apostle Paul, in one of his first inspired letters, cautioned Christians not to be deceived by false preaching or by false letters purporting to be from the apostles. "Let no man deceive you by any means; for that day" — the time of God's intervention in human affairs when Jesus Christ will return to rule the nations — "shall not come except there come A FALLING AWAY FIRST" (II Thess. 2:3). In Acts 20:29-38, Paul, the teacher of the Gentiles, explained HOW the apostasy would begin. He gathered the elders (ministers) of the church at Ephesus to deliver them a final message concerning their responsibility over the local congregations. "For," said Paul, "I KNOW THIS, that after my departing shall grievous wolves enter in among you, not sparing the flock. Also OF YOUR OWN SELVES shall men arise, speaking perverse things," why? — "TO DRAW AWAY DISCIPLES AFTER THEM." To gain a personal following for themselves! To start new denominations! Do you catch the full significance of these two verses? The elders or ministers were especially assembled because, IMMEDIATELY AFTER PAUL WOULD LEAVE EPHESUS — not at the time of the Protestant Revolt, but IMMEDIATELY — there would come within the local church congregations false ministers, wolves in sheep's clothing, to make a prey of Christians; and even from those elders ALREADY IN THE CHURCH CONGREGATIONS some would pervert the doctrine of Jesus to secure a following of "Christians" themselves. Paul instructed the evangelist Timothy to "reprove, rebuke, exhort with all long suffering and doctrine. For the time will come that they will not endure sound doctrine; but AFTER THEIR OWN LUSTS" — the congregations wanting to do what they please — "shall they heap to themselves teachers" — elect ministers who will preach what they want to hear — "and they shall turn away their ears from the truth, and shall be turned unto FABLES" (II Timothy 4:3,4). Not only Paul, but also Peter warned the churches that MANY would be misled. False teachers among Christians would bring in heresies, "and MANY shall follow their pernicious ways, by reason of whom the WAY OF TRUTH shall be evil spoken of" (II Peter 2:2). Jude, the apostle, and brother of Jesus, had to include in his letter the stern admonition that every Christian "should earnestly contend for the faith which was ONCE delivered unto the saints. FOR THERE ARE CERTAIN MEN CREPT IN UNAWARES, who were before of old ordained to this condemnation, ungodly men, TURNING THE GRACE OF GOD INTO LASCIVIOUSNESS, and denying the only Lord God, and our Lord Jesus Christ ... These be they who separate themselves, sensual, having not the Spirit" (Jude 3 and 19). These false teachers CREPT IN UNAWARES — professing to come in the name of Jesus Christ. Yet they DENIED that Jesus is the Christ BY REJECTING THE ONLY SIGN that proves that He is the Messiah (Mat. 12:39,40) and substituted for it the "Good Friday-Easter Sunday" tradition. "MANY false prophets (or preachers) are gone out into the world ...," he warned. They professed to bc Christ's ministers, they came in the name of Christ; but they were anti-christs! John continues: "They are of the world: therefore they speak of the world, AND THE WORLD HEARETH THEM. We are of God: who knoweth God heareth us, who is not of God" — whoever does not obey Him — "heareth us not" (I John 4:1,5-6). Do you grasp the meaning of these verses? "Even now have many antichrists arisen ... THEY WENT OUT FROM US (they left the Church), but they were not of us; for if they had been of us, they would no doubt have continued with us; but they went out, that they might be made manifest that they were not all of us" (I John 2:18-19). This is why there are so many denominations today! John wrote of the same condition in II John 7: "For MANY DECEIVERS are gone forth into the world ... WHOSOEVER GOETH ONWARD AND ABIDETH NOT IN THE TEACHING of Christ, hath not God." Those false teachers who left the true Church "professed to know God" — they pretended to obey God — "but by their works they denied Him, being abominable and DISOBEDIENT, and unto every good work disapproved" (Titus 1:16). They professed Christ and the Father; but they rejected the authority of God and His law! They were DISOBEDIENT. They acknowledged that Jesus was the Christ; they came IN HIS NAME, professing to be the ministers of Christ — but they rejected His message. In the letter of the apostle John to Gaius, we read: "I wrote unto the church, but Diotrephes, who loveth to have the pre-eminence among them, receiveth us not. Wherefore, if I come, I will remember his deeds which he doeth, prating against us with malicious words: and not content therewith, neither doth he himself receive the brethren, and forbiddeth them that would, AND CASTETH THEM OUT OF THE CHURCH" (III John 9 and 10). The true Christians, who alone comprised the true Church, WERE BEING PUT OUT OF THE VISIBLE, ORGANIZED CONGREGATION. They were the SCATTERED ones of whom John said: "Therefore the world knoweth us not" (I John 3:1). But that did not mean the scattered individuals were not part of the Church. They WERE the Church because they were joined to Christ through the Holy Spirit. Those who drove them out became the FALSE church — the church of the god of THIS world — "the synagogue of Satan." BUT JESUS PROMISED TO BE WITH THE FAITHFUL REMNANT OF HIS CHURCH TO THE END OF THE AGE — to guide His people into truth. FIRST, they were typical of general conditions among God's people anywhere. That is why we today are admonished to hear what the Holy Spirit says to ALL THE SEVEN CHURCHES. WHY have all Bible students, until NOW, been unable to identify these churches? It is due to the fact that everyone has ASSUMED, erroneously, that these picture the seven stages of the visible, organized churches which have called themselves "Christian." In other words, it has been assumed that the churches OF THIS WORLD are pictured in Revelation 2 and 3 as continuations of the true Church in apostolic days. Everyone, it seems, has SUPPOSED that, following the apostolic Church, these seven churches picture the course of history in the Greek and Roman Catholic and the Protestant churches — the churches of the god of THIS world! These two chapters of Revelation picture, and convey God's message to THE TRUE CHURCH OF GOD — the Church in which CHRIST lives and works — the Church which is HIS BODY — His instrumentality — the Church HE USES! It is the Church that was scattered, persecuted unorganized — many of whose members have been martyred. This Church is composed of members who, even though begotten by and led by the Holy Spirit, yet are human and therefore not perfect. In the message to each of these seven churches Jesus has a word of correction. In every case He points out things they need to overcome. But they are the people who have and are led by His Spirit, who put themselves under GOD'S government instead of human traditions or self desire or the way that seems right to a man, and who have in the main THE TRUE GOSPEL, even though they often lost vital portions of it. Notice, chapter 2, verse 1: "These things saith He that holdeth the seven stars (the angels of the True Church) in His right hand, WHO WALKETH IN THE MIDST OF THE SEVEN GOLDEN CANDLESTICKS" (THESE SEVEN CHURCHES). Jesus Christ is IN these churches. They are His churches, not Satan's churches which falsely masquerade as "Christian." And remember the TRUE Church has not been politically organized, powerful and recognized by the world — but scattered, persecuted, SELDOM NOTICED by the world and even then regarded as heretics. Now let's UNDERSTAND who they are, one by one. The church at Ephesus pictured the APOSTOLIC CHURCH — a Church which patiently labored in the gospel, which met many false apostles but remained steadfast to the truth (Rev. 2:1-7), and which continued, though scattered, until the time of Emperor Constantine. Jesus called out disciples, teaching them the gospel, setting them an example by His own ministry. He authorized them with the greatest commission ever given to human beings — to preach the "gospel of the Kingdom of God in the whole world" (Matthew 24:14, Mark 16:15). Before Jesus ascended to the throne of God, He commanded the apostles and disciples to remain in Jerusalem until they were imbued with the Holy Spirit, which made them the begotten sons of God, put them into His Church (I Cor. 12:13), and endued them with the POWER OF GOD to carry out His work! JESUS FOUNDED HIS CHURCH BY SENDING THE PROMISED HOLY SPIRIT ON THE DAY OF PENTECOST, MONDAY, JUNE 18, 31 A.D. — a date ABSOLUTELY established by the exact and INSPIRED mathematical and astronomical computations of God's Sacred Calendar. THERE WERE TWO 19-YEAR CYCLES IN THE HISTORY OF THE APOSTOLIC CHURCH DURING WHICH THE GOSPEL WAS CARRIED TO THE OLD WORLD. It was exactly 19 years from A.D. 31, when the Church was founded, to the time Paul received the vision to go into Europe! In Acts 16:9 Paul had a vision of a man in Macedonia (in Greece) who shouted, "Help us!" Paul described this even in II Cor. 2:12-13 where he wrote that "a DOOR was opened unto me of the Lord" by which he meant that a way was opened to preach the gospel in Europe. Paul went into Europe about the time of Pentecost in the late spring of 50 A.D. After a few months of preaching, he arrived in Corinth in the fall of that year (Acts 18:1) where he remained for A YEAR AND SIX MONTHS (verse 11). It was now the beginning of 52 A.D. An insurrection broke out against Paul when Gallio was deputy or pro-consul of Achaia (verse 12). A recently discovered inscription in Greece states that Gallio held this position during 52 A.D., which proves that the gospel went to Europe in 50 A.D., just 19 years after the Church was founded! From 50 A.D. it was another 19 years until the fleeing of the Headquarters Church at Jerusalem in 69 A.D. Here is what happened in 69 A.D. on the Feast of Pentecost — exactly two 19-year cycles after the Holy Spirit came on the day of Pentecost: "Moreover," records Josephus, the Jewish historian, "at that feast which we call PENTECOST, as the priests were going by night into the inner court of the temple ... they said that in the first place they felt a quaking, and heard a great noise, and after that they heard a sound as of a multitude, saying, LET US REMOVE HENCE (From "Wars of the Jews", bk. VI, ch. v, sec. 3). God's people did REMOVE HENCE! The Christians in Jerusalem fled to Pella, beyond the River Jordan. From that time forward the UNITED power of the Church of God to spread the gospel of the Kingdom ceased. Christians throughout Judaea were scattered because of the Jewish wars. The headquarters church at Jerusalem, to whom all churches could look as the standard of TRUTH, was now moved to Pella. Church at Jerusalem Was a "Headquarters Church"
The Church of God which had been at Jerusalem was a "headquarters church" to whom all looked for TRUTH! Other local churches often became confused. Controversies and disputes on certain points entered. It was to the Jerusalem church, now moved to Pella, WHICH HAD GOD'S AUTHORITY, that they all turned. Let's notice it. In Acts 15:1 and 2, we read of a dispute that arose in the local churches in Antioch, Syria and Cilicia. In their midst were Paul and Barnabas, both of great authority in the church. Yet to whom did the brethren turn in order to settle the dispute? TO THE HEADQUARTERS CHURCH — JERUSALEM — WHERE THE OTHER APOSTLES AND ELDERS WERE GATHERED! At Jerusalem the question would be considered and DECIDED — why? Because the brethren KNEW that Jesus had given special AUTHORITY to His ministers who were at the headquarters church — Jerusalem. Jesus conferred upon His representatives the keys of the kingdom of God and authority to guide the Church through the inspiration of the Holy Spirit. They could "bind," or FORBID certain things; and they could "loose," or permit certain things. In Matthew 18:18, Jesus gives his ministers the authority to make BINDING DECISIONS, based on the revelation of God and under the inspiration of the Holy Spirit, in order to preserve the unity of the Church in LOVE and TRUTH. This explains the reason that the brethren mentioned in the book of Acts turned to the headquarters church at Jerusalem to settle their questions and disputes. They knew Jesus had promised to guide His apostles into all truth (John 16:13). The apostles had been thoroughly trained and fitted for their responsibilities through the personal correction, reproof and instruction of Jesus. The apostles in turn had thoroughly instructed the elders and the congregation at Jerusalem in the way of truth. The church at Jerusalem was kept PURE by the constant admonition and correction of the elders and apostles SO THAT IT MIGHT BE THE EXAMPLE TO ALL other churches. Christians, like all human beings, need to learn BY EXAMPLE. In New Testament times the churches in Gentile nations "became followers of the churches of God which in Judaea are in Christ Jesus" (I Thess. 2:14); and the churches in Judaea were to pattern themselves after the headquarters church, the church at Jerusalem. The congregation at Jerusalem, later at Pella, recognizing this responsibility, acted in her capacity. The apostles and elders made the decisions and they were binding on all other churches (Acts 15:22). They sent letters to the various local congregations explaining what "seemed good to the Holy Spirit, and to us" (Acts 15:28). Again, in a previous situation, when it was known that certain individuals had preached in Antioch, and news of "these things came unto the ears of the church which was in Jerusalem ... they sent forth Barnabas, that he should go as far as Antioch" (Acts 11:22). Jerusalem remained the headquarters church during the entire apostolic period. When the church moved to Pella, it continued as a headquarters church for the "Ephesian Era" of the Church. ROME WAS NEVER THE PARENT OR HEADQUARTERS CHURCH. The Churches of God which Paul raised up in Asia Minor were later under the general supervision of the apostle Peter. Peter wrote to the Churches in Asia and Galatia (I Peter 1:1). Catholic writers have acknowledged for centuries that the apostle Peter watched over the Gentile converts from the ancient city of Antioch, which was, next to Jerusalem, the most important center of Church life (Acts 14:26-28). Consider what happened at Rome. The local Church of God at Rome, which was built up by Paul's, not Peter's, teaching, was severely persecuted by Nero in 64 A.D. Nero falsely charged the Christians with burning the city. Perhaps some three or more years after the burning of Rome Paul was seized near Troas (II Timothy 4:13) and brought to trial at Rome where he was martyred. Events were now moving rapidly. While the Church in the East was being held together through Pella and Antioch, the Roman Church — with most of its leading members martyred — BECAME THE PREY OF FALSE TEACHERS. As soon as Peter was martyred, probably before 70 A.D., events moved to a climax. (See Ramsey's "The Church in the Roman Empire to 170 A.D.") There was no James or Peter or Paul. John alone was in charge. The apostasy was developing rapidly — especially in the West. Many people who listened to false teachers began to look for new leaders and new headquarters. They did not look to Christ, the head of the Church! Where did they turn? At this moment in history, the centuries-old pagan tradition was revived and widely circulated that "Peter" had been in Rome. The heathen had never heard of the APOSTLE Peter. But everyone at Rome had heard that there was a shrine of A Peter on Vatican hill and that THAT Peter traditionally had come from Babylon. Who was that Peter? Let the shocking record of history answer! When the Babylonian mysteries in Mesopotamia were broken up by Alexander the Great and introduced into the West, they gravitated to Pergamos and then to Rome. Rome had long been a center of religion. And the most important part of Rome was Vatican hill. "The Vatican sanctuary ... seems to have been a well-known ... cult center ... of the worship of Cybele (the "Mother of God") ... No less than nine inscriptions referring to the same cult have long been known from the immediate vicinity of St. Peter's ..." (from "The Shrine of St. Peter and the Vatican Excavations", by J. Toynbee and J. W. Perkins, p. 6). In the days of the apostles a "pagan cemetery lay on a knoll called Vaticanus" — Vatican hill, where the headquarters of the Roman Catholic Church is today. "The Latin word "vatis" means a 'prophet' or 'soothsayer.' In days gone by there had been an Etruscan oracle on this spot," writes Werner Keller in "The Bible as History", p. 389. Notice that this Satanic oracle was a SOOTHSAYER — one who soothed the people by preaching what the people wanted to hear. And it was associated with a cemetery. The chief object of reverence at this cemetery CENTURIES BEFORE THE TIME OF CHRIST was the shrine or tomb of a "Peter"! But why would pagans be honoring "Peter" long before the apostle Peter was ever heard of? But how did Nimrod — "Peter" — become associated with Rome? Because it was to Rome that Nimrod fled from his pursuers. The ancient name of Rome was "Saturnia," recorded Pliny in his "Natural History", bk. 111. But what does "Saturnia" mean? It means the dwelling place of "Saturn." And the inhabitants of ancient Italy called NIMROD "Saturn," meaning "the hiding one" — because he "lay hid" from his pursuers at Rome (Jackson's "Chronological Antiquities", p. 233). Nimrod was discovered hiding at Rome. There he was executed. It was now an easy task for Anacletus to convince the drifting, unemployed pagan population of Rome — which was becoming interested in the mysteries — that the shrine at Rome was the site of burial of the apostle Peter — for had not the apostle Peter been at Babylon! And to cement his authority, he claimed to have been ordained by Peter. But there were still faithful churches, though small in number, who kept "the commandments of God and the testimony of Jesus Christ" (Rev. 12:17). The world called them "Nazarenes" — the same name used in the Bible to refer to Paul and the true Church (Acts 24:5). Among the Gentiles the churches in Asia remained the most faithful to the word of God. We pick up the story of the true Church in the lives of such men as Polycarp and Polycrates. They were called "Quartodecimani" because they kept the true passover celebration instead of Easter. "But Polycarp also was not only instructed by the apostles, and conversed with many who had seen Christ, but was also, by apostles in Asia, appointed bishop of the Church of Smyrna ... He it was who, coming to Rome in the time of Anicetus" — bishop of Rome around 154 A.D. — "caused many to turn away from the ... heretics to the CHURCH OF GOD, proclaiming that he had received this one and sole truth from the apostles ... While at Rome, Polycarp discussed with the Roman bishop the matter of the introduction of the pagan Easter in place of the passover. Irenaeus continued: "For neither could Anicetus (the bishop of Rome) persuade Polycarp not to observe it" — the passover — "BECAUSE HE HAD ALWAYS OBSERVED IT WITH JOHN THE DISCIPLE OF OUR LORD, and the rest of the apostles, with whom he associated; and neither did Polycarp persuade Anicetus to observe it, who said that he was bound to FOLLOW THE CUSTOMS of the presbyters before him" (Quoted from Eusebius' "Ecclesiastical History", book V, chap. 24, in the "Nicene and Post-Nicene Fathers", Vol. 1). Notice that bishop Anicetus had no scriptural grounds — he determined to follow the "customs" of men! — Easter Sunday! But the Easter controversy did not end here! Within 35 years it broke out vehemently between Polycrates of Asia Minor and Victor of Rome, who attempted to "cut off whole churches of God, who observed the tradition of an ancient custom" — the true passover. "As for us, then, we scrupulously observe the exact day, neither adding nor taking away. For in Asia great luminaries have gone to their rest, who shall rise again in the day of the coming of the Lord ... I speak of Philip, one of the twelve apostles ... John, moreover, who reclined on the Lord's bosom ... Then there is Polycarp ... THESE ALL KEPT THE PASSOVER ON THE FOURTEENTH DAY OF THE MONTH, IN ACCORDANCE WITH THE GOSPEL, WITHOUT EVER DEVIATING FROM IT, BUT KEEPING TO THE RULE OF FAITH." This remarkable letter is preserved in Vol. 8 of the "Ante Nicene Fathers", pp. 773-774. Polycrates came from that area in which Paul spent most of his time — in Asia Minor, near Ephesus. This is also where John spent his last days. HERE WE HAVE CHRISTIANS STILL REMAINING TRUE TO THE FAITH! Here is proof that both the apostles to the circumcision and Paul, the special apostle to the Gentiles, taught the true Church to observe the passover on the 14th of the first month of God's sacred calendar. Chrysostom, who wrote several centuries after the apostles admitted that "formerly it (the passover) prevailed also at Antioch" from where Paul began many of his apostolic journeys. But the Church as a whole never repented of leaving its first love for the truth of God. Jesus was now about to fulfill His warning: "I will come unto thee quickly, and will remove thy candlestick out of his place" (Rev. 2:5). Thus ended the first age of the Church, typified by the "Church at Ephesus." The prophesied "Church at Smyrna" arises next. Its people appeared physically poverty-stricken — yet it was spiritually rich and alive, though SUFFERING through PERSECUTION. This pictures God's Church during the next three centuries under the persecuting power of the Catholic-dominated Roman Empire. Besides the true Church there was also a "Synagogue of Satan" (Rev. 2:9) dominating during this period. The "Synagogue of Satan" — What Is It? Now read Revelation 2:9. "I know the blasphemy of them which say they are Jews, and are not, but are the synagogue of Satan." This church claims that they are spiritually Jews. Why? Because Jesus said, "Salvation is of the Jews (John 4:22). "To the Jew first, then also to the Greek" (Rom. 1:16). "He is a Jew," says Paul, "which is one inwardly; and circumcision is that of the heart, in the spirit, and not in the letter; whose praise is not of men, but of God" (Rom. 2:29). In Romans 11:16-27 Paul explains that Israel and the Jews, to whom salvation belonged, were broken off because of unbelief. Gentiles were grafted in their place. But once grafted in, they were no longer Gentiles — "BEING IN TIME PAST Gentiles in the flesh" (Eph. 2:11). Now they were all one in Christ Jesus, "no more strangers and foreigners, but fellow citizens with the saints" (Eph. 2:19). So here was a church made up of Gentiles, claiming salvation, claiming to be Jews inwardly, masquerading as a "Christian" church, yet the very tool of Satan himself! This synagogue of Satan is the great apostate church which developed after 70 A.D. and ultimately became recognized as the State Religion of the Roman Empire. That Church has had many Protestant daughters which are also Satan's churches (Rev. 17). "But before this time another most virulent disorder had existed, and long afflicted the Church; I mean the difference respecting ... Easter. For while one party asserted that the Jewish custom (as to time) should be adhered to, the other (did not). "Accordingly, the people being thus in every place divided in this respect ... no one appeared who was capable of devising a remedy ... BECAUSE THE CONTROVERSY CONTINUED EQUALLY DIVIDED BETWEEN BOTH PARTIES ... Constantine appeared to be the only one on earth capable ... He convoked a general council ..."
"At this meeting the question concerning ... Easter was discussed ... First of all, it appeared an unworthy thing that in the celebration of this ... feast we should follow the practice of the Jews ... Let us then have nothing in common with the Jews ... It has been determined by the common judgment of all, that the ... feast of Easter should be kept on one and the same day." The Council of Nicea decided, under his authority, that Easter MUST be celebrated on Sunday and that the Passover must be forbidden! "... To speak of your criminality as it deserves demands more time and leisure than I can give ... Why not at once strike, as it were, at the root of so great a mischief" — he means the TRUTH OF GOD — "BY A PUBLIC MANIFESTATION OF DISPLEASURE?" — by inciting persecution, in other words. Constantine continues: — "Forasmuch, then, as it is no longer possible to bear with your pernicious errors, we give warning by this present statute THAT NONE OF YOU HENCEFORTH PRESUME TO ASSEMBLE YOURSELVES TOGETHER. We have directed, accordingly, THAT YOU BE DEPRIVED OF ALL THE HOUSES IN WHICH YOU ARE ACCUSTOMED TO HOLD YOUR ASSEMBLIES: and (we) forbid the holding of your superstitious and senseless meetings, not in public merely, BUT IN ANY PRIVATE HOUSE OR PLACE WHATSOEVER ... Take the far better course of entering the Catholic Church ....We have commanded ... that you be positively deprived of every gathering point for your superstitious meetings, I mean all the houses of prayer ... and that these be made over without delay to the Catholic Church; that any other places be confiscated to the public service, AND NO FACILITY WHATEVER BE LEFT FOR ANY FUTURE GATHERING, in order that from this day forward none of your unlawful assemblies may presume to appear in any public or private place. Let this edict be made public" (from Eusebius' "Life of Constantine", book 3). The servile Eusebius sums up the work of Constantine by declaring: "And the credit of having achieved this mighty work" (of stamping out the truth) "our Heaven-protected Emperor alone, of all who had gone before him, WAS ABLE TO ATTRIBUTE TO HIMSELF" (bk. 3, ch. 66). Everyone was now forced to observe a pagan Easter or flee the confines of the Roman Empire. Not even the persecutions of pagan Rome, which raged for 10 long years — 303-313 — (see Rev. 2:10, where a prophetic "day" represents a "year" in fulfillment — Numbers 14:34), matched the terrible slaughter of Constantine's "Christian" Rome. From the Council of Nicaea (325 A.D.) to about the death of Constantine, the persecution raged. It is only from the enemies of God's Church that we have scanty, malicious records of God's people, who were now maligned as "heretics" and "enemies of the church." These records attribute beliefs to God's people which they never held. Heretics and the true Church are often called by the same names. For centuries Catholic writers mention small remnants of the true Church within the bounds of the Roman Empire. Sometimes they were individuals, sometimes scattered families, and especially in the Near East there were still a few local congregations preaching the gospel and keeping the commandments. As late as the beginning of the fifth century in Asia Minor, the bishop Chrysostom bewailed members of the Catholic Church, who upon learning the truth from the scattered remnants of the true Church, repented of their ways and began to observe the sabbath and "the feast of trumpets, the feast of tabernacles, and the feast of the great expiation" (Bingham's "Antiquities of the Christian Church", Bk. XVI, ch. VI). As a result of the Council of Nicaea (325 A.D.), the great false Church commenced 1260 years of Tribulation (Rev. 12:6) with full force. The true Church fled into the valleys and mountains in Europe and Asia Minor. Now notice what John writes to the next age of God's Church — the "Church at Pergamos": "I know thy works, and where thou dwellest, even where Satan's seat is: and thou holdest fast my name and has not denied my faith" (Rev. 2:13). The local church to which John wrote was situated in Pergamos, the capital of the Roman province of Asia in Asia Minor — Pergamos was Satan's seat of worldly human government for that province. Just as the local Church at Pergamos was situated in a city where Satan swayed human politics, so the next work of God's church occurred within the bounds of Satan's government — the Eastern Roman Empire — where a small body of God's people was found. The names given to these people of God by their enemies were "ATHYNGANI" — meaning "those who understood prophecy" — and "PAULICIANS" — the followers of the apostle PAUL. The reports circulated about the doctrines of these people were slanderous and false. Often "false brethren" who lived among God's people were confused with the true Church. It was not till almost the beginning of the twentieth century that a book called "THE KEY OF TRUTH", containing many of their teachings — and the teachings of other groups — was translated into English by Fred C. Conybeare. This partially preserved record of God's people proves that THEY PREACHED THE GOSPEL OF THE KINGDOM, THAT THEY BELIEVED THE CHURCH WAS FOUNDED NOT ONLY UPON JESUS CHRIST, BUT ALSO UPON THE APOSTLES AND PROPHETS (EPH. 2:20); THAT THEY BAPTIZED BY IMMERSION; THAT THEY LAID ON HANDS FOR THE "RECEPTION OF THE SPIRIT" (p. CXXIV). THEY NOT ONLY "CONTINUED TO KEEP THE PASSOVER ON THE FOURTEENTH OF NISAN," BUT THEY ALSO OBSERVED THE SABBATH AND THE FESTIVAL OF UNLEAVENED BREAD (pages CLXII and CLII of "The Key of Truth"). The devil was angry with these people who understood the gospel and kept the commandments. Knowing that he could not overthrow their faith by force, he corrupted them by introducing false teachers who taught the "doctrine of Balaam" (Rev. 2:14). In turning to Numbers 31:16, you will see that Balaam induced the Israelites to practice idolatry and commit spiritual fornication. These unconverted teachers gradually induced many in the Church to celebrate certain IDOLATROUS pagan holidays, particularly the Orthodox feast of Epiphany — the original birthday of Nimrod, the pagan "Christ child" — supposedly in honor of Christ's birth and baptism. Satan also caused many to take part in worldly politics in the hope of safeguarding themselves. Mixing with the politics of this world is called "fornication" in Revelation 17:2. God's Church is to be a virgin and remain pure and SEPARATE FROM THE WORLD, waiting for the marriage to Christ (II Cor. 11:2). As a result of these sins, Jesus warned his Church: "Repent; or else I will fight against thee with the sword of my mouth" (Rev. 2:16). Most took the warning lightly until it was too late. Trusting in their worldly political alliances with neighboring Arabs, instead of relying on Jesus' protection, they were betrayed and slaughtered — one hundred thousand of them! The faithful few who escaped were driven to Southeastern Europe and called Bogomils. "There they throve for centuries, and ... spread ... their tenets into Bohemia, Poland, Germany, Italy, France, and even into ... England" (p. CIV). The prophesied "Church at Thyatira" arises next. John was inspired to commend the "Church at Thyatira" because the last works of the Church were more than the first. In the local Church there was a false woman teacher (symbol of a great Mother Church) who taught some to practice idolatry. Jesus warned He would cast them into great tribulation and "kill her children (Protestants) with death" unless they repented (Rev. 2:18-29). Now let us notice how this description fits exactly the next great expansion of God's people. As a result of the evangelization of the Alpine regions by the Paulicians and Bogomils of Bulgaria, as God's people were called, there arose numerous ministers and faithful congregations around 1000 A.D. One of these men was Peter de Bruys who preached the gospel of the Kingdom in the south of France (Jones' "Church History", ch. 4, sec. 3). Two other preachers of the time were Arnold and Henry. They were charged by the Catholic Church with remaining faithful to the whole law of God and of observing the sabbath ("Ecclesiastical History", by Peter Allix, pp. 168-169). The Lutheran historian Mosheim admits that the congregations of the Church in the twelfth century held "a notion that the observance of the law of Moses, in everything except the offerings of sacrifices, was obligatory upon Christians ... they abstained from those meats the use of which was prohibited under the Mosaic economy, and celebrated the Jewish Sabbath. The second tenet which distinguished this sect was advanced in opposition to the doctrine of three persons in the divine nature." Yes, they knew that God was not a trinity, but a family! A crusade was instituted against many of these people in Southern France. Thousands perished. But when it seemed that the FIRST WORK WOULD SOON BE ENDED, there arose an even GREATER leader among God's people. It was the close of the twelfth century. In Lyons, France, lived an astonishingly successful and wealthy merchant, Peter Waldo. "One day, while in the company of some of the leading citizens, one of his friends fell lifeless at his side. Terrified by the event, he said to himself: If death had stricken me, what would have become of my soul?" Being a Catholic, Waldo asked one of these theologians what is the PERFECT way. 'Ah!' answered the theologian ... 'here is Christ's precept': '"If thou wilt be perfect, go, sell that thou hast and give to the poor, and thou shalt have treasure in heaven, and come take up thy cross and follow me."'" (Comba, "History of the Waldenses", p. 21). God was using Peter Waldo. Comba says that "he brought to the study of the Scriptures that practical common sense which had guided him in his business transactions ... The word of Christ was clear enough, for Waldo it was simply a question of furnishing a literal translation" (p. 243 of Comba's "History"). The humble remnant of the Church of God listened to him. Soon many new disciples were coming to repentance. "His disciples became almost as many CO-WORKERS for him" (p. 26). The world called them Waldenses. God's Church was once again spreading the gospel! A SCHOOL FOR MINISTERS WAS ESTABLISHED TO PROVIDE THE TRAINED HELP TO CARRY THE GOSPEL. Called the "Church of God"
Now let's notice what John wrote to the "Church at Sardis." The "Church at Sardis" had a name that it was alive BUT IT WAS DEAD (Rev. 3:1). Only a minute fraction of its people were really surrendered to God and holding to the faith once delivered. This is just the picture of the Church of God for 400 years after the outbreak of the Reformation. Through the preaching of Lollard and other helpers, hundreds were repenting. Thousands were learning for the first time that baptism means immersion — that the world's religious holidays came from paganism and that Sunday was not the Sabbath. After a period of persecution, there remained only a few who kept the faith and observed the Sabbath and God's annual Holy Days. When confronted with imprisonment at the hands of Protestant "reformers" for their faith, several ministers gave up the faith even though some of their followers remained steadfast (Cox's "Sabbath Literature", Vol. 1, p. 162). It was not until about 1650 that there were again enough Sabbath keepers to establish local congregations. They often called themselves the Church of God, but the world termed them "Sabbatarians" and Sabbatarian Baptists. But as always happens, after several generations the children take truth for granted and never really surrender their wills and their lives to God. In less than one hundred and fifty years, the English churches almost disappeared, having cut themselves off from God BY TURNING FROM His truth, and by adopting the name "Seventh-day Baptists." 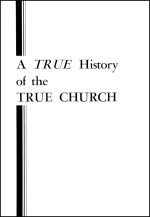 Several faithful congregations did not become members of the Conference because they would not submit to the new Protestant doctrines being introduced (see p. 246 of Belcher's "Religious Denominations). For another half century the congregations maintained the little truth they possessed, although most of them did not go all the way in obedience to God. John aptly described this period: "Be watchful, and establish the things remaining, WHICH ARE ABOUT TO DIE, for I have not found thy works perfected before my God" (Rev. 3:2). They called themselves the "Church of God" and began publishing "The Advent Review and Sabbath Herald". Their first songbook was dedicated to "The Church of God scattered abroad." With each passing year, new and different doctrines were being introduced by Ellen G. White to explain away the Adventist failure of October 22. 1844. The original Church of God brethren generally did not go along, with the "inspired testimony" of Ellen G. White. Finally, a meeting was held by some of the members in Battle Creek, Michigan, September 28 through October 1, 1860. "No name which we can take will be appropriate but that which accords with our profession, and expresses our faith, and marks us as a peculiar people. Presumably this makes the Apostle Paul a fanatic because he called the church "the Church of God." In the spring, of 1861 another conference was held in an unscriptural effort to reorganize local congregations. The following covenant was recommended for this new church organization: "We, the undersigned, hereby ASSOCIATE OURSELVES TOGETHER AS A CHURCH, TAKING THE NAME OF SEVENTH-DAY ADVENTIST ..."
"Brother Smith: We conclude from present aspects that the name, 'Seventh Day Adventist,' is being made obligatory upon our brethren. Without further light Ohio cannot submit to the name 'Seventh Day Adventist,' as either a test, or an appropriate name for God's people. "Being appointed a finance committee at the last conference, and having now on hand means for carrying on the cause in Ohio, we could not conscientiously expend these means in any other than the advancement and extension of the truth and the 'Church of God.' ..." Signed by the Finance committee of Ohio. Thus in the space of sixty years, two major departures from the Church of God occurred. The church — THE ONLY TRUE CHURCH LEFT ON EARTH — was falling apart like the decayed branches of a tree! The ministers would not strengthen that which was ready to perish! FOR ANOTHER SEVENTY YEARS conditions remained almost unchanged. The remaining brethren retained the name "Church of God," with headquarters finally at Stanberry, Missouri. Among local congregations only a few individuals repented and strengthened the truth that was ready to perish in their midst. But most of the ministers resorted to organizing pitifully weak evangelistic work on the pattern of state conferences rather than yielding themselves to God's government and direction in the carrying of the gospel with power. In fact, instead of the true gospel, most ministers taught a "third angel's message," which they had accepted from the Adventist people. They also published a small paper called the "Bible Advocate." Notice the amazing description of the next event in the history of God's people. John writes to the "Church at Philadelphia": "I know thy works: behold, I HAVE SET BEFORE THEE AN OPEN DOOR, and no man can shut it: FOR THOU HAST A LITTLE STRENGTH, AND HAST KEPT MY WORD AND HAST NOT DENIED MY NAME" (Rev. 3:8). Here is a Church which Jesus loves despite its smallness! Here is a Church to which He says: "Because thou hast kept the word of my patience (which Jesus interprets in Revelation 14:12 as KEEPING THE COMMANDMENTS and the faith), I also will keep thee FROM THE HOUR OF TEMPTATION WHICH SHALL COME UPON ALL THE WORLD, TO TRY THEM THAT DWELL UPON THE EARTH" (Rev. 3:10). Jesus chose Paul, who was highly educated, for spreading the gospel to the Gentiles. He later raised up Peter Waldo, a successful businessman, to keep His truth alive during the Middle Ages. In these last days WHEN THE GOSPEL MUST GO AROUND THE WORLD, Jesus chose a man amply trained in the advertising and business fields to shoulder the mission — HERBERT W. ARMSTRONG. Paul was struck down. Waldo was shocked by the sudden death of his friend. In like manner God three times swept away Mr. Armstrong's business in order that he might come to understand the truth. Not long after his ordination in 1931 (see "A History of the True Church", by Dugger and Dodd, p. 304), a momentous juncture occurred. A movement was under foot to organize the local congregations of the Church of God under human government — a financial board of seven men. By 1933 certain leading ministers demanded that no more NEW truth be preached to the brethren. They were refusing to repent and allow the Holy Spirit to work through them to establish the truth that was ready to perish! The time had come for the gospel TO GO AROUND THE WORLD! Having tested and proven that Mr. Armstrong would remain faithful and subject to His government, God opened before him and a few faithful brethren the marvelous DOOR of radio and the printing press to carry forth the gospel. From a minute beginning in Oregon, in 1934, the work of God spread to cover much of North America in 19 years. In 1953 it leaped to Europe and the world! God gave the Apostolic Church JUST TWO nineteen-year cycles to carry the gospel to the Old World. He opened a DOOR to the apostle Paul AT THE BEGINNING OF THE SECOND NINETEEN-YEAR CYCLE by which the gospel went to Europe (Acts 16:9; II Cor. 2:12-13). So now, just before the second coming of Jesus Christ, God has given His Church — THIS CHURCH — JUST TWO nineteen-year cycles in which to carry the gospel to the world! Do you catch the significance of this? It means that this work, this MISSION to which God has called us all, is a DIVINE WORK, a DIVINE MISSION — not the work of some one man. It is the work of THE CHURCH OF GOD to whom Jesus committed this GREATEST task ever to fall upon mortal men — the carrying of His gospel, the good news of the Kingdom of God, to ALL nations. We are a people with "little strength," but God has set before us an OPEN DOOR WHICH NO MAN CAN SHUT. We must use that door. We must become zealous, working, praying, studying, giving tithes and offerings as we have never given before, so that this gospel can go IN POWER around the world! Notice that this Church has not denied God's NAME. What is the true name of the Church? The Bible gives the true NAME of the Church in TWELVE different places. Twelve, remember, is God's COMPLETE number. 1) Acts 20:28. The admonition to the elders is to feed THE CHURCH OF GOD." 2) I Corinthians 10:32. "Give no offense, neither to the Jews, nor to the Gentiles, nor to The Church of God." 3) I Corinthians 11:22. "... or despise ye The Church of God, and shame them that have not?" 4) I Corinthians 15:9. Paul wrote: "For I persecuted The Church of God." 5) Galatians 1:13. This verse repeats the one last given — "I persecuted The Church of God." Notice that Paul did not call the true Church "Catholic" or "Protestant." Nowhere is the true Church called after the name of a MAN or after the name of a doctrine. 6) I Corinthians 1:2. "The Church of God which is at Corinth." 7) II Corinthians 1:1. "The Church of God which is at Corinth." 8) I Timothy 3:5. In speaking of a local elder in a local congregation, Paul wrote Timothy: "For if a man know not how to rule his own house, how shall he take care of The Church of God?" 9) I Timothy 3:15. "... behave thyself in the house of God, which is The Church of The Living God." Here it is The Church of the LIVING God. 10) I Corinthians 11:16. "... we have no such custom, neither The CHURCHES OF GOD." 11) I Thessalonians 2:14. "For ye, brethren, became followers of The Churches of God which in Judaea are in Christ Jesus." 12) II Thessalonians 1:4. "So that we ourselves glory in you in The Churches of God." These verses prove the name of the true Church. Denominations NOT bearing this name could NOT be God's true church. And of all the churches that do bear the name, ONLY ONE could be the TRUE Church of God — that one which OBEYS ALL the commandments of God and maintains the FAITH delivered once for all time — the one which GROWS in truth. All others are counterfeit, even though they may have the knowledge about the true NAME of God's Church. Since Christ is the Head of the Church, Paul also called the various congregations "the churches of Christ" (Romans 16:16) — but the actual NAME is the CHURCH OF GOD. It is kept in the NAME OF THE FATHER (John 17:11). While we are instructed, in Heb. 10:23-25: "Let us hold fast the profession of our faith without wavering; and let us consider one another to provoke unto love and to good works: NOT FORSAKING THE ASSEMBLING OF OURSELVES TOGETHER, as the manner of some is; but exhorting one another: and so much the more, as ye see the day approaching" — yet, notice carefully, we are not instructed to assemble with blinded, deceived people in the denominations. The instruction is "not to forsake the assembling of OURSELVES together" — that is, true Christians who have the TRUTH, who are filled with God's Holy Spirit, truly converted, and WALKING IN THE LIGHT, living by every Word of God. It is time you knew why! The fallen "woman" of Rev. 17 is clearly identified as the great false Church, which ruled over the kings of the Roman Empire from 554 until 1814. Her doctrines and practice, falsely called by Christian names, are actually the same identical "Chaldean mysteries" of the ancient Babylonian Baal worship, denounced in the Bible as the most idolatrous of all false worship. Notice Rev. 17:5: she is called "BABYLON THE GREAT, THE MOTHER OF HARLOTS." She is a MOTHER church. She has DAUGHTER CHURCHES. She calls the Protestant denominations her wayward daughters. They came out of her, IN PROTEST, calling themselves "Protestant." They, like their mother church, participate in the governments and politics and affairs of this world. Thus they reject the Government of God! This (verse 2) is the cause of her fall from grace. All Protestant denominations contain a certain mixture of false Roman doctrines which have been handed down from the ancient Babylonian idolatry. It is an ORGANIZED SYSTEM, even though divided into hundreds of sectarian organizations. Shall the true Christian JOIN, and thus become a PART OF this apostate system? Notice, "the inhabitants of the earth have been made drunk with the wine of her fornication." (v. 2.) They are spiritually drunk on her false doctrines, until they are unable to see clearly Bible TRUTH — their spiritual eyesight is blurred. They are spiritually BLIND. The truth is, GOD DID NOT PLANT THESE CHURCHES. And Jesus said, Every plant, which my heavenly Father hath not planted, shall be rooted up. LET THEM ALONE: they be blind leaders of the blind. And if the blind lead the blind, both shall fall into the ditch" (Mat. 15:13-14). The Bible does not say we are to assemble with the world, but with OURSELVES — THOSE WHO ARE TRULY CONVERTED. God has not convoked weekly religious meetings on Sunday morning! Neither are we to assemble on Saturday with an apostatizing Church which sees the ARGUMENT about the Sabbath but which follows the false visions of a woman "prophetess" and rejects the gospel of THE KINGDOM OF GOD. God is not in these churches. They merely assemble themselves together, by their own authority and not by the command of God's ministers. If you are converted and made righteous by the Spirit of God, "what fellowship hath righteousness with unrighteousness? and what communion hath light with darkness?" (II Cor. 6:14). No, God commands us, "Have NO FELLOWSHIP with the unfruitful works of darkness" (Eph. 5:11). If God has opened your understanding to His TRUTH, it is precious beyond price. "If there come any to you, and bring not this doctrine, receive him not into your house, neither bid him Godspeed, for he that biddeth him Godspeed is partaker of his evil deeds" (II John 10-11). When the disciples asked Jesus if MANY were being saved, he explained that the many turn into the broad way that leads to destruction — but FEW find the straight and narrow way that leads to everlasting life. Those in His true fellowship He called the "LITTLE FLOCK." Remember, our fellowship is WITH THE FATHER, AND WITH JESUS CHRIST first of all, and with one another ONLY IN AND THROUGH CHRIST (I John 1:1-7). You can have communion and fellowship with Him wherever you are. Withdraw at once from all other fellowship, except that of CHRIST, and those who are IN CHRIST, and Christ IN THEM. In John 15:5. Jesus said: "I am the vine, ye are the branches." What would you think if the branches would say to themselves, let us bundle ourselves together? Yet that is exactly what you are doing when you meet OF YOUR OWN ACCORD WITHOUT MINISTERS! To be a Christian you need to "abide" in Christ — you need to LIVE by HIS instruction. Do the branches of a grapevine receive their sap from each other? Or do they receive it from the central stump? You need to receive your spiritual power from Christ — the vine. Not from a branch — an individual who thinks he would like to hold a private study. In Eph. 4:11-17 Paul explains that Christ gave evangelists, pastors and teachers and other ministerial offices "for the perfecting of the saints ... for the edifying of the body of Christ: till we all come in the unity of the faith, and of the knowledge of the Son of God, unto a perfect man ... that we henceforth be no more children, tossed to and fro, and carried about with every wind of doctrine, by the sleight of men, and cunning craftiness ... but speaking the truth in love, may grow up into him in all things." But didn't Jesus promise that wherever two or three brethren gather together, He would always be in their midst? Now notice Jesus LAST WARNING to His Church. At the VERY CLOSE of this age, when the work of spreading the gospel is almost finished, Jesus addressed yet another Church work — the "Church at Laodicea": "I know thy works, that thou art neither cold nor hot: ...I WILL SPUE THEE OUT OF MY MOUTH (Rev. 3:15, 16). This frightful condition lies now ahead of us. Just as the remnants of the Sardis era of the Church exist side by side with the Philadelphia era, SO WE WILL CONTINUE OUR WORK to the very "end time" when another group will appear — a group not accounted worthy to escape the coming tribulation. Another separate work is yet to arise — made up of begotten individuals who are spiritually lukewarm! WOE BE TO ANY OF US IF WE TAKE PART IN SUCH A WORK! Here is a work, yet to arise because of our preaching, which will say: "I am rich, and increased with goods, and have need of nothing." And Jesus will reply: "As many as I LOVE, I rebuke and chasten: be ZEALOUS therefore, and repent." It is time to WAKE UP! If you become complacent, lacking in zeal, looking upon a local church as a social club, instead of having your heart in the gospel, you, too, may find yourself in the "Church of Laodicea" left to suffer the impending, horrifying tribulation. Notice Jesus' admonition for today in Luke 21:36. "WATCH ye therefore and PRAY ALWAYS, that ye may be accounted worthy to escape ALL these things that shall come to pass, and to stand before the Son of Man." Let us all PRAY and WORK TOGETHER to carry this gospel to all nations so Jesus will say to each of us, "Well done, thou good and faithful servant."